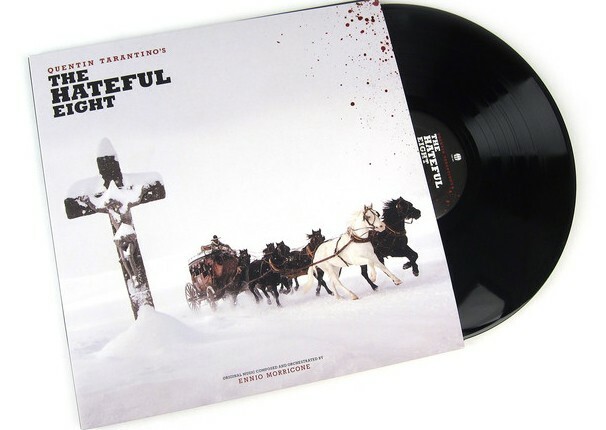 A deeper look at the grooves pressed into the Hateful Eight official soundtrack LP by Ennio Morricone. We live in the good times, people â€“ and by that I mean the times when we can get lush over-the-top vinyl pressings of some pretty peculiar stuff. A Quentin Tarantino soundtrack in no exception, especially because vinyl is the perfect format for a Tarantino movie. Instead of rehashing old tunes with new bands, Tarantino sticks to the original cuts, for that vintage flavor that a lot of movies could make great use of these days. In other words, Tarantino movies are what movie soundtracks are made for. After all, the man himself has said that he often starts writing his movies by picking out the soundtrack. His latest movie, The Hateful Eight, has managed to somehow kick things up a notch. Mostly because this time things are getting serious. This being a western, it sounds fitting that Tarantino would recruit famed spaghetti western composer Ennio Morricone for this film. The results? Moody and incredibly tense. What did Tarantino think when he first heard it? â€œItâ€™s horrible. What do you expect me to say? Youâ€™ll hear it when you see it. Itâ€™s absolutely abysmal. No thereâ€™s no whistling in this score.â€ Was he kidding? No, not about the whistling. Because accompanied by this soundtrack, The Hateful Eight leaves you at the edge of your seat for three hours straight, and fits in perfectly with the dim, dreary, winterâ€™s setting of the movie. This is the first time a Tarantino score has been collected in its entirety on a soundtrack, and this includes fifty minutes of original music that Morricone composed exclusively for the film. These fifty minutes are basically variations on the one theme (which you only have to hear once to recognize) and vary in length and intensity. Included also are three additional non-Morricone tracks and various movie dialogues (one of which might even be from a deleted scene). So, just like the movie, this soundtrack is a monster.